The resort is located right on the edge of the Müritz National Park, between Müritzsee, Tollensesee and the Rheinberger Lakes region, amidst an almost untouched nature with many lakes and pristine forests. 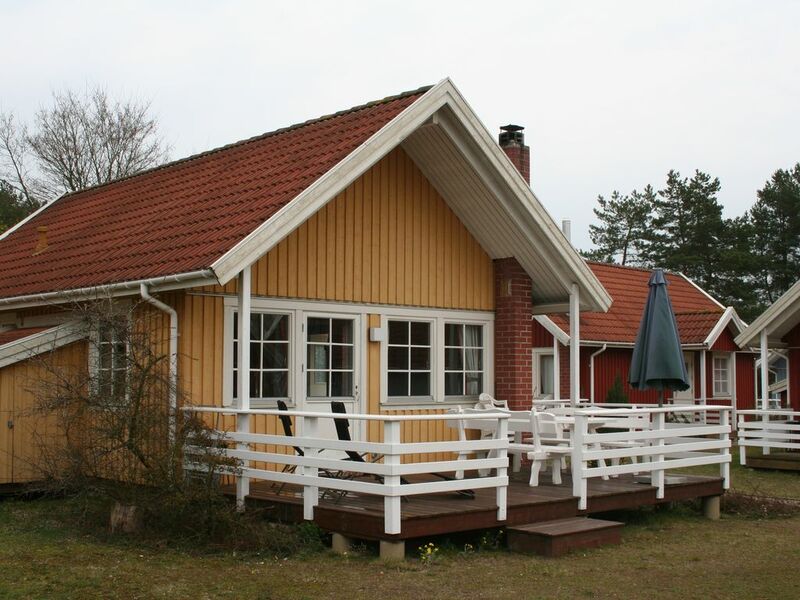 The resort consists of a total of 32 Swedish wooden houses for four to eight people. The children in front of the house, but also play on the playground of the resort. There is a sandpit, play area, swings and much more. A modern sports facility in a fenced field children and adults meet to the football, dodgeball or basketball games. For table tennis you can borrow rackets and balls at the reception. A big beach volleyball court invites all. At the fireplace you can roast sausages and breads Stock. Boats can be rented at the front desk or in place, thus making extensive boating. Bringing pets is not allowed in the facility for guests. The house no. 24 (65m²) is suitable for up to six people. It has three bedrooms, two on the ground floor (1 with double bed; 1 with bunk beds), the third is a closed sleeping loft with two single beds. Cosy living / dining area with exit to the terrace, fireplace, corner seat in the dining area, radio, cable TV, DVD recorder, Electric central heating. The kitchen is fully equipped with oven, 4-burner stove, dishwasher, fridge freezer, microwave, kettle, coffee maker, toaster, blender, blender, dishes, glasses, cutlery, pots. 20 sqm terrace with a wooden table set and 2 sunloungers. The house is very suitable for families with children. Out of courtesy to all guests should be no smoking in the house. The town Userin, with about 600 inhabitants offers an Edeka-Laden by canoe and mailroom. The approximately 100 meters away, about 5 sq km lake is ideal for swimming, boating, sailing and fishing. He belongs to the upper Havel lakes, has connection to the Havel waterway and must not be driven with motorboats. This allows you to enjoy nature undisturbed and relax. The former residence and current county seat Neustrelitz is located 8 kilometers away and offers many shopping, sightseeing (castle, harbor, etc. ), restaurants and a zoo, the well-known National Theatre and a modern cinema. Outside the high season the house can also be booked for a shorter period than a week. In this case comes at current prices (weekly price / 7) once the final cleaning of 35.00 € to do so. In the complex there is also a children's playground with play equipment and sandpit. Additional property before the tourist resort is a new, modern sports complex with soccer, volleyball and basketball courts available.